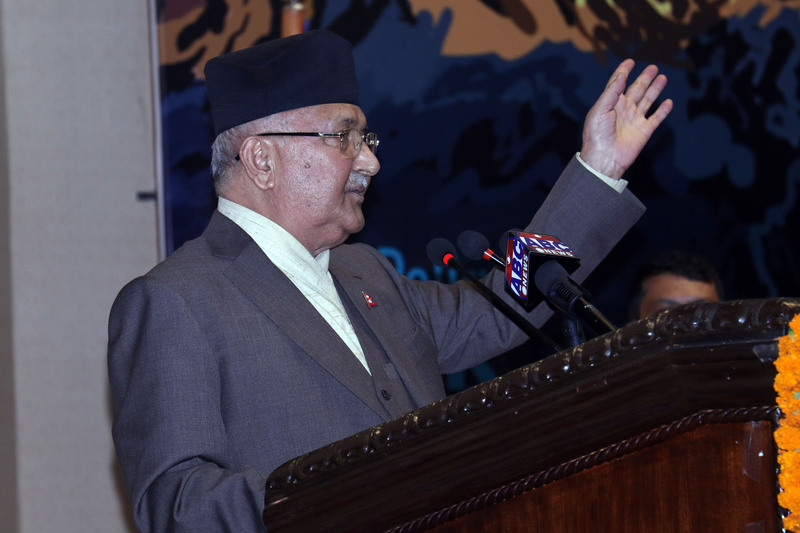 Nepal Foreign Affairs (KATHMANDU, 8 October 2018) – Prime Minister KP Sharma Oli has reaffirmed his commitment that the government would achieve the agenda of development and good-governance in the country. Unveiling the book ‘ Abataran’ (Safe Landing) by journalist Shuva Shankar Kandel here today, PM Oli vowed that he will leave no stone unturned to meet the public expectations towards the government. Stating that the people of this country had the thumping majority’s mandate, Oli committed that he would not do anything that disrespect their trust. He urged the opposition party not to doubt over anything as the peace process in the country was brought to a logical end and stated that Nepal has already entered into a new era. Claiming that the government has undertaken important works in the last seven months, PM Oli assured that the new challenges would be addressed. He explained that the formulation of new laws relating to implementation of the fundamental rights, amendment of the various Bills and establishment of a new office in all seven offices were among the key tasks undertaken by his government. Oli was of the view that not everything would be resolved just because republic system was introduced in the country. Oli, who is assuming the position of the Head of Government for the second time, pledged to be honest to use democracy for the people. On a different note, the PM asserted that there will not be impunity against any culprit who commits crime against humanity. As for the newly released book, PM Oli said that the book centered on the themes as the Maoist movement and its safe landing, alliance of the then CPN-UML and the then CPN-Maoist Centre, had hinted at some challenges and possibilities of the alliance. Also speaking at the event, CPN Chairperson Pushpa Kamal Dahal ‘Prachanda’ stated that no book would be able to illustrate and chronicle from the Maoist movement to the peace process of Nepal in a better way than the book that ought to be written by PM Oli and himself. Reminiscing the contribution and courageous efforts of late leader Girija Prasad Koirala in advancing the peace process in the country, Dahal admitted of committing some grave mistakes during and before the peace process. He also assessed that forging unification between the communist forces and Maoist party’s decision to send their cadres to the cantonments during the peace process were the right decisions made at the right time. Likewise, Nepali Congress leader Shekhar Koirala had a differing view with PM Oli’s statement about the peace process in the country. Koirala said that the peace process was yet to be brought to the end in the country completely. He claimed that the incumbent government formed by two-thirds majority failed to ensure good-governance in the country. On the occasion, commentator Prof Krishna Khanal and foreign affairs expert Ramesh Nath Pandey shared that the newly launched book has incorporated several issues that were yet to be revealed among public and it has beautifully illustrated the aspects of insurgency, transformation and left alliance.